Do you need to add a new modern or historical name or name variant to a place resource in Pleiades? Here's how to do it. 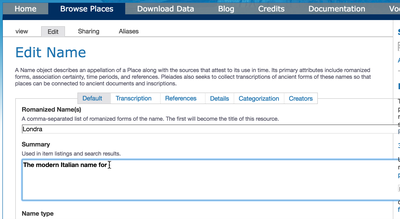 If you know the name (either historical or modern) of an ancient place in Pleiades, but see that it's not included in our dataset, you can easily add it and submit it for review and eventual publication. You should also add appropriate name resources to any new place resource that you are creating so that you can submit them as a set. 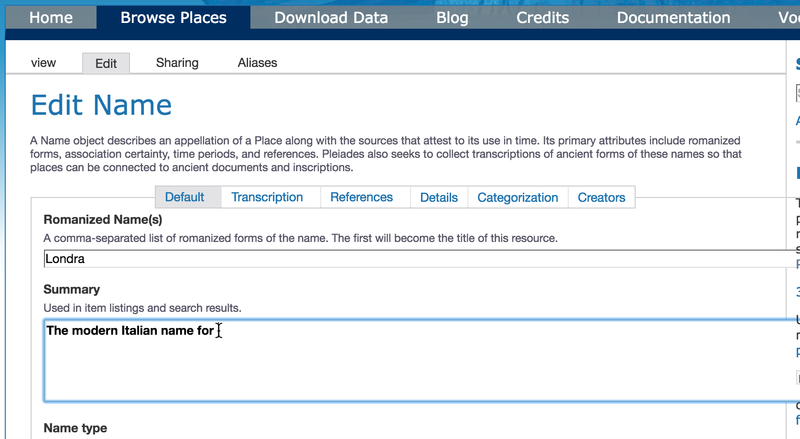 Pleiades stores geographical and historical information in four "information resources": places, names, locations, and connections. If you are not familiar with these terms and how they are used in Pleiades, you should first consult the short Conceptual Overview. The editors have set out their expectations for the content of name resources in a section of the Editorial Guidelines. You should also consult it before starting to add name resources. 2. Navigate to the place resource to which you wish to add a name. 3. Scroll down the page to the bottom of the "Names" listing and select the "Add Name" button. 4. Pleiades creates a new name resource, assigns it to you, and automatically opens a form through which you can edit its contents. This new name resource begins life in "drafting" state, and is invisible to the public and other users (apart from the editorial college and site managers). Other contributors, when logged in, are able to see an entry for the resource (title and your name) in the Names listing on the parent place page, but they cannot see the contents of your draft. This level of visibility is intended to prevent duplication of effort by contributors. You may modify and save the new name resource multiple times until you are ready to submit it for review. 5. On the "Add Name" form use the component navigation tabs ("Default", etc.) together with the individual data entry fields and the "Save" button at the bottom of the page to record the modifications you wish to make. Please note editorial expectations and standards for names as outlined in the Editorial Guidelines document. 6. After the first time you save the form, you can open it again by selecting the "Edit" tab on the gray tertiary menu bar. It will now be titled "Edit Name" instead of "Add Name", but is otherwise identical. 7. When you are satisfied with the modifications you have made to the name resource, submit it for review by the editorial college by selected "State: Drafting" from the gray tertiary menu bar and then selecting "Submit for review" from the drop-down menu. 8. If the editors have any questions or concerns about the content or format of your submitted name resource, they will contact you by email. If not, they will publish it. Upon publication of the name resource, your personal name will appear in the "Creators" section of the new name resource and in the "Contributors" section of the parent place resource. The contribution will also be reflected on the Pleiades Credits page. 9. If, after submitting the name resource, you realize that you have made a mistake or omitted to save a change, you can retract the submission and return the working copy to "drafting" state by selecting "State: Pending review" from the gray tertiary menu bar and then selecting "Retract" from the drop-down menu. This will permit you to make further changes. Retraction only works when the working copy is still in "Pending" state. If an editor has already published your changes, you will not be able to retract the resource. Instead, send an email to pleiades.admin@nyu.edu that includes the URI of the affected resource and explains the problem.